Leo’s family runs a bakery. As she is too young Leo isn’t allowed to partake in the bakery activities. Leo soon realizes that there might in fact be another reason to it. 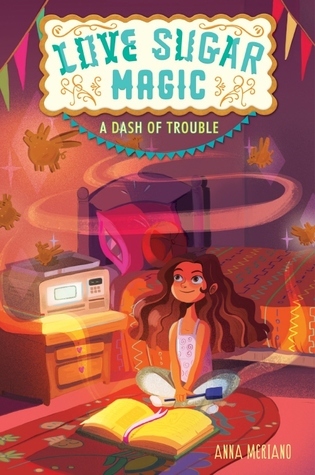 With the help of her best friend Caroline, Leo discovers that her family are practicing magic! I heard about A Dash of Trouble through Twitter. The cover and the synopsis was cute so I decided to purchase myself a copy. I am happy to say that I loved it! The book is written in third person limited following Leo. There are chapter titles, and chapter numbers along with an illustration. There are poems. The spells were mostly in Spanish. At the end of the book there’s a section labeled Leo’s Lucky Recipes. And lastly baking similes. I loved the family aspect! Leo is very close with her family. I liked how unique all the sisters’ were. Isabel the kind oldest and calm one. Marisol the second oldest while a bit rude still caring in her own way. Alma and Belen the twins who are the closest in age to Leo. Thus are a bit closer. I also liked Leo’s parents and aunt Paloma. Leo and Caroline’s friendship was also well done! Caroline’s mother passed away due to cancer prior to the book. Sometime after that Caroline and her father moved. The family returns back home. And it’s like no time has passed at all between the girl’s. There’s also Brent whom I took some time to warm up to. Regardless he grew on me. I absolutely loved the diversity! Leo’s family are Spanish. There culture is present in their magic, as the women are Bruja’s. Caroline is half Colombian. She helps Leo translate some spells. The book actually begins with The Day of the Dead festival. I felt that the author wrote realistic middle graders. All the social problems even felt so. Especially with Brent and the peer pressure he felt in leaving Caroline. Which also ties in to the magic mishaps. Leo decides to put a love spell on Brent so he would go back to being friends with Caroline. Of course this doesn’t end well. And it effects the social hierarchy system. I really liked Leo’s growth! Throughout the book Leo believes she can solve the problem on her own. In doing so she lies to her family and Caroline. Even to herself. All under the assumption that if her family found out rather than helping her they would stop her from using magic. Leo sees the error in her ways and confesses to everyone. While also owning up to her mistakes. Overall I loved A Dash of Trouble! I highly recommend this series.